Practice your searching skills while working on your articulation abilities with this fun and exciting speech therapy game. 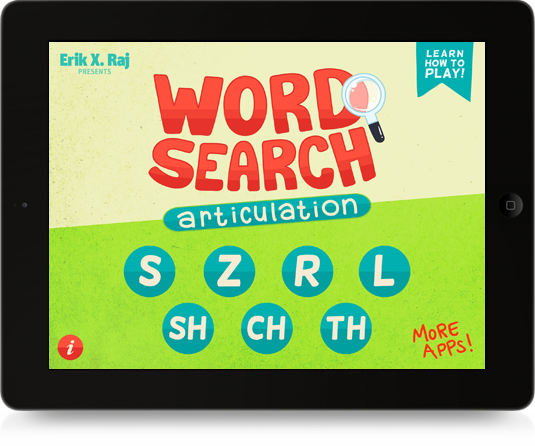 Word Search Articulation is jam-packed with over 1,000 sound-specific articulation words that can be hunted for. These puzzles contain hidden words designed for speech-language pathologists to use with individuals who exhibit difficulty producing the following speech sounds: S, Z, R, L, S/R/L Blends, SH, CH, and TH. Tons of words: with just a tap of a finger, players can search for and practice over 1,000 sound-specific articulation words that are PERFECT for the speech therapy setting. Child-friendly interface: simple AND intuitive, just the way it should be. Word Search Articulation allows students to play hide and seek with their articulation words. At the start of each round, the given word hides in a grid filled to the brim with jumbled letters. In an attempt to discover the hidden words, children must concentrate and focus their eyes on the grid to spot those sneaky words. 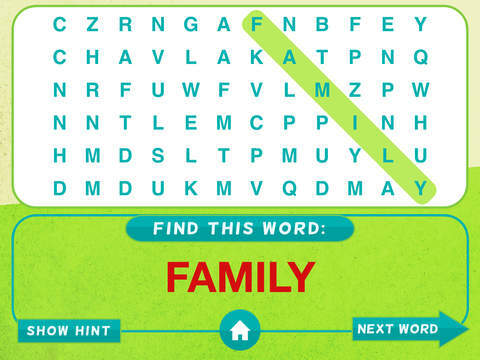 These puzzles demand great detective work because all of these words are fantastic at hiding. However, if a student gets stumped and is unable to find the hidden word, the ‘hint’ button is always an option. 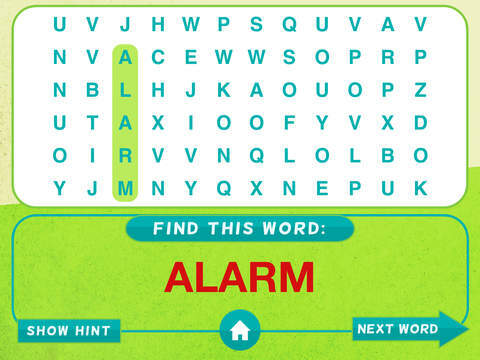 This could be pressed at any point during the word search and it causes the first letter of the hidden word to become highlighted. This child-friendly feature ensures that all students will experience success as they participate in this wonderful word hunt adventure. Traditional speech therapy that focuses on improving articulation abilities can usually get stale and boring, but through Word Search Articulation, speech therapy can easily become an enjoyable competition that strengthens students’ attention, concentration, and pronunciation. It is the hope of this speech-language pathologist that by encouraging students to participate in this game, they will be able to practice their overall articulation in a way that can lead to fabulous gains toward mastering their speech therapy goals and objectives. Hooray! The structure of Word Search Articulation is a departure from traditional articulation drill work and is effective for students ages 6 and up. With this game, clients have a blast challenging their friends and classmates outside of the speech therapy room, further practicing their articulation skills and thereby facilitating the sometimes difficult stage of carrying over newly-acquired skills. 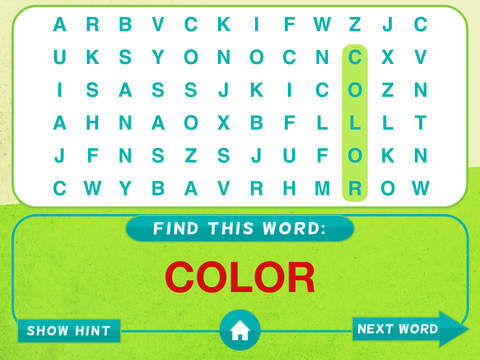 By playing Word Search Articulation with the client, paraprofessionals in the classroom and/or parents at home can reinforce the client’s skills while sharing an entertaining activity. Practicing communication skills in environments outside the speech therapy setting increases opportunities for generalization of communication skills. In the past, word searches had nothing to do with speech therapy. Now, thanks to Word Search Articulation, word searches and speech therapy have been effectively combined (and I am happy to announce that they both live together in perfect harmony!). I guarantee that you will fall in love with Word Search Articulation and I invite you to use this game to spice up your speech therapy sessions. Regardless of when, where, or how Word Search Articulation is used within the speech therapy session, one thing is certain, children (as well as clinicians) will have a delightful time giving this game a try . . . and in the process, your students will continue to practice the correct pronunciation of their sounds at the word level.